No renewal for Level I is necessary. To join, you must complete the GWRRA REP Level I form, have it validated by any GWRRA Officer, and mail it to the address indicated, along with a $6.00 fee for each registrant. 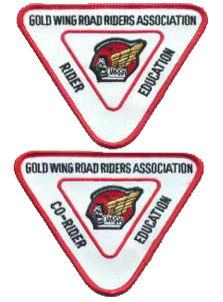 You will receive a "Safe Miles" Patch, Rider or Co-Rider rocker, and mileage pin indicating how many safe miles you have ridden since joining GWRRA or since your last accident. If you have an accident of any type, whether you are at fault or not, your safe miles pin should begin at zero and count forward from that time. New members will begin the task of completing their first 5,000 safe miles and receive a 5,000 mile pin getting them started in the program. You may receive additional Safe Mileage Pins as you accumulate safe miles by having your miles validated by a GWRRA Officer. Complete the Level I form (again) and send it with $2.00 to the address shown on form. You will receive your new mileage pin to display on your "Safe Miles" Patch. Rockers are available for increments of 100,000 miles to be displayed under your patch. Pins are available in 5,000 mile increments. Aside from the obvious benefit of being committed to safe operation of your motorcycle, you can receive a possible premium reduction in your GWRRA endorsed motorcycle insurance. Other insurance carriers may give similar reductions in price. Rider or Co-Rider must be enrolled in Level I of the GWRRA Rider Education Program. Rider must have a current motorcycle license or endorsement (if required in your state). Complete the GWRRA REP Level II form and have it validated by any GWRRA Officer and mail along with $5.00 for each participant, to address indicated. Participant(s) will receive a red triangle patch signifying Level II participant. Participants have now achieved a greater potential for safety due to the successful completion of a riding course and/or Co-Rider Seminar. They may also be eligible for an additions insurance premium reduction depending on the carrier. In order to remain current in Level II you must continue to meet all the original qualifications of Level II and submit an update form as course completion and certifications come due. It would be great if we could achieve the coveted goal of zero accidents, however, we know realistically this is hard to attain. Since accidents will and do occur, it is important that we be fully prepared to lend aid to unfortunate accident victims. We should always be prepared to save a life. The Level III of the GWRRA Rider Education Program was developed to deal with such circumstances by recognizing and encouraging proper First Aid or CPR training. CPR, a level III requirement has been used to save many lives. Being trained to render CPR or give First Aid is a tremendous asset. Rider or Co-Rider must be current GWRRA member. Rider or Co-Rider must be enrolled in Level I and current in Level II. Rider or Co-Rider must have a current CPR or First Aid card. First Aid certifications are normally current for three (3) years. CPR certifications are normally current for one year. (Check card's expiration date.) Proof of this card must accompany application. Rider or Co-Rider must wear protective riding apparel. Rider must carry a First Aid kit on the motorcycle. Complete the Level III form have it validated by any GWRRA Officer and mail with $4.00 for each participant, to the address indicated. 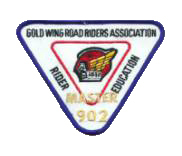 Participant will receive a Certified Tour Rider or Certified Co-Rider patch to display above the Level II triangle patch. In order to remain current in Level III you must continue to meet all the original qualifications of Level III and submit an update form as course completion and certifications come due. The participant has now completed the three (3) Levels of GWRRA's Rider Education Program. Completed Level III Certified Tour Rider/Co-Rider Program and have been current in Level III for one year minimum. Must have driven (ridden for Co-Riders) at least 25,000 Safe Miles. Must have a current CPR and First Aid cards. Must wear protective riding apparel. Must carry First Aid kit on motorcycle. Obtain GWRRA Officer signature on Level IV application. Send copies of current cards with Level IV application as noted below. Mail above documentation & $35 for each participant to the address indicated. You will receive two (2) special triangular patches with dark blue border and the Master Level IV sequence number embroidered on it. In order to remain current in Level IV you must continue to meet all the original qualifications of Level IV and submit an update form as course completion and certifications come due.